This plan allowed a generous amount of time for each stage of the game, plenty of time for finding caches. After a quick wash-up, we packed up our bags and headed back down to center camp, where Scheherazade and Boing were locked up and breakfast awaited. Once again, I held a table while Eric waited in a long line for a simple breakfast of a bagel for me and a muffin for himself, with tea. A wilderness experience, indeed. 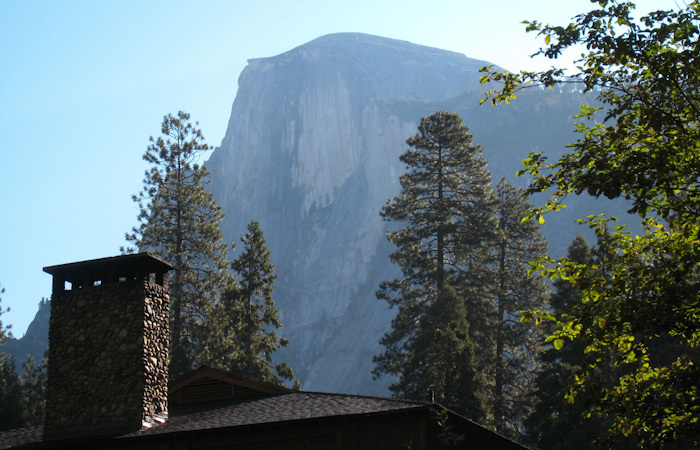 Eric took a picture juxtaposing one of the buildings at Curry Village with Yosemite's most famous landmark, Half Dome. 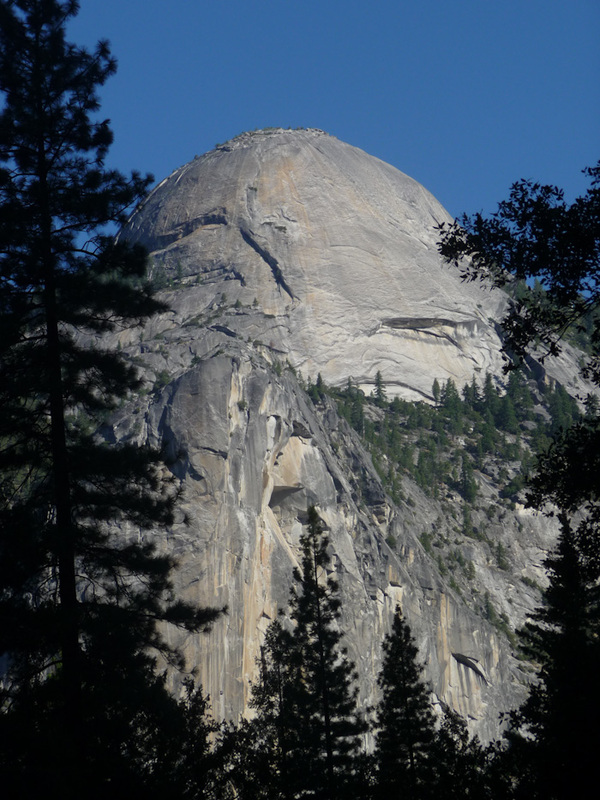 I took no pictures of Half Dome, hoping that the morning haze would lift and we would get a better view of the feature, but by the time the view cleared a bit, we had moved to a place where we could no longer see it. 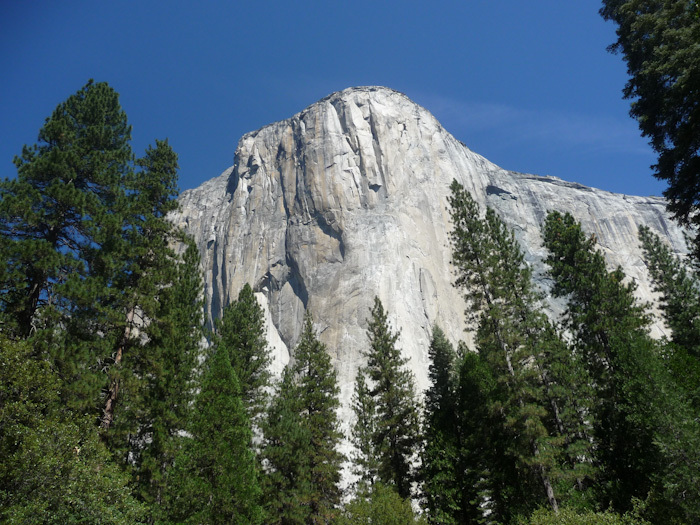 I was glad Eric had at least taken one picture, and, as he said, I compensated for missing Half Dome by "photographing the hell out of El Capitan." 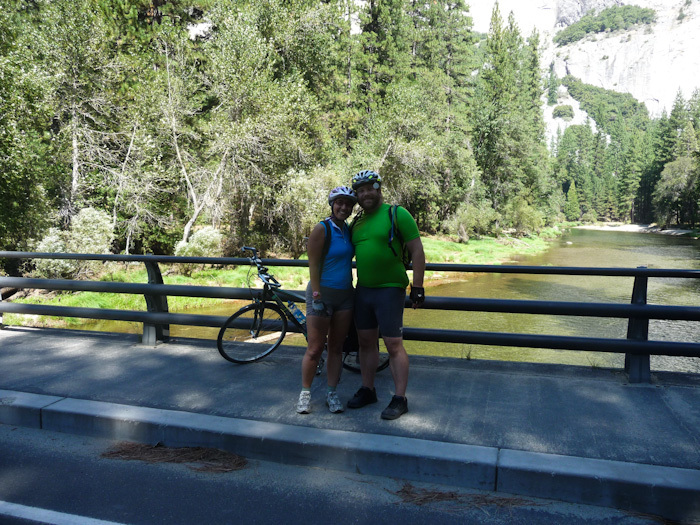 We followed a car-free bicycle loop to the end, deep into the valley. It was cool and shady. Photo by Eric. Eric took a picture of the Royal Arches, under North Dome. We found another of those "never would have seen it without a geocache" places under Happy Isles Bridge. The cache was a virtual (as physical caches are not allowed in national parks), and we couldn't find one of the necessary bits of information. We decided to see whether the cache owner would let us log it with one piece of information and photographs of ourselves at the site. We really were doing extremely poorly on the geocaching front! The cache site was lovely, under Happy Isles Bridge. North Dome came into better view. 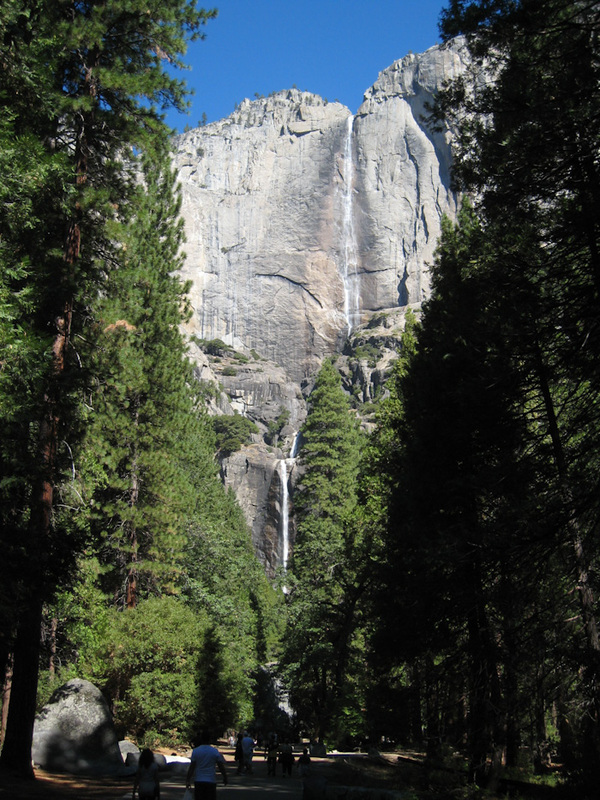 The end of trail was at a place called Mirror Lake, but it became a footpath only near the end. Not wanting to take the time to lock up our bikes and walk down the path, we turned around at that point, after a quick bag of Snap Pea Crisps and a chat with a family from New Zealand. 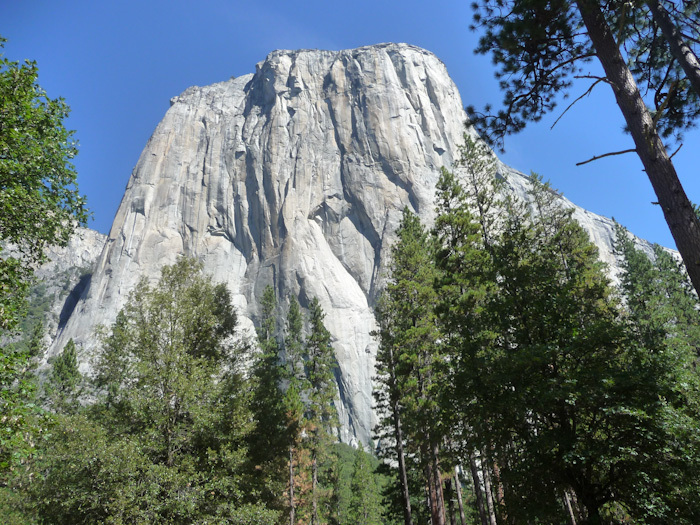 We made our way back through the valley along the lovely one-way, two-lane car road, enjoying the park's world-famous sights. 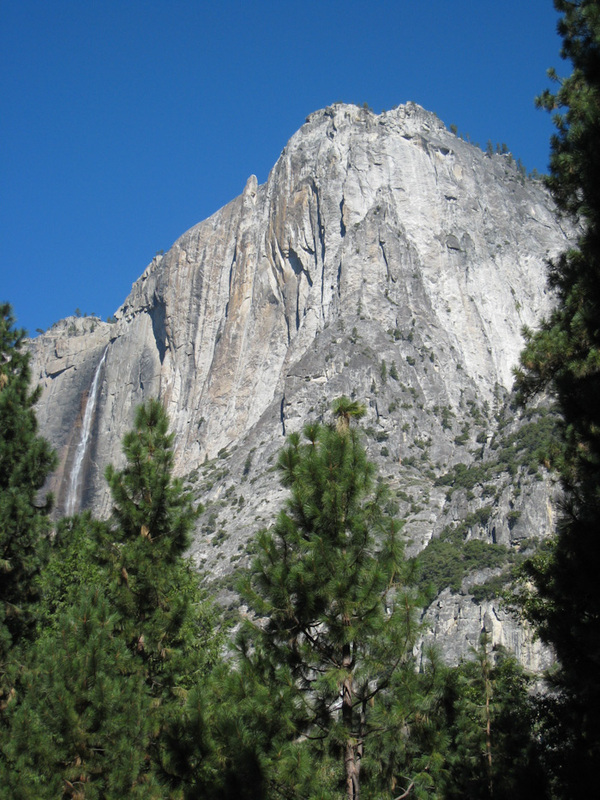 Eric took a picture of Upper Yosemite Falls. Here is the entire falls, the tallest year-round falls in North America and the sixth highest in the world, according to Wikipedia. Photo by Eric. We had hiked to the summit sometime in the mid-90's, and ended up coming back down the hill in the dark, having had to borrow a flashlight from some strangers. That was another exciting adventure. 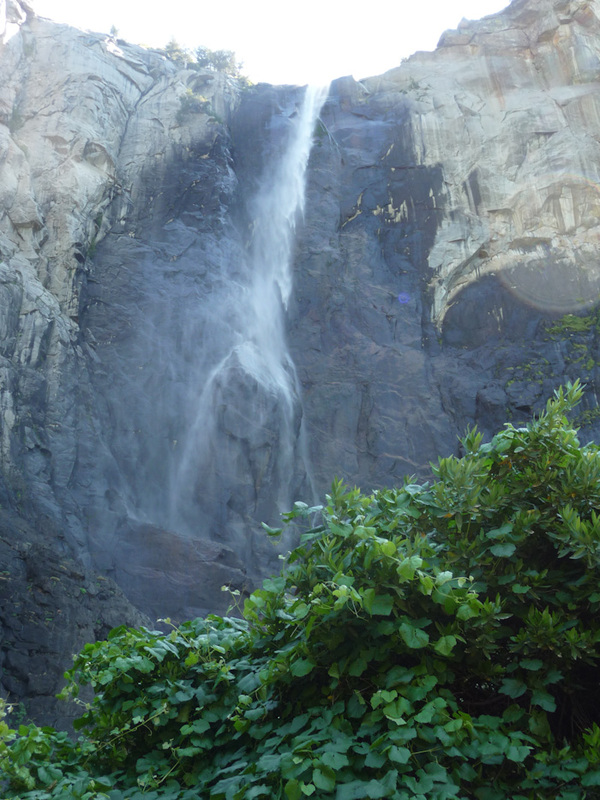 Here are the lower falls. 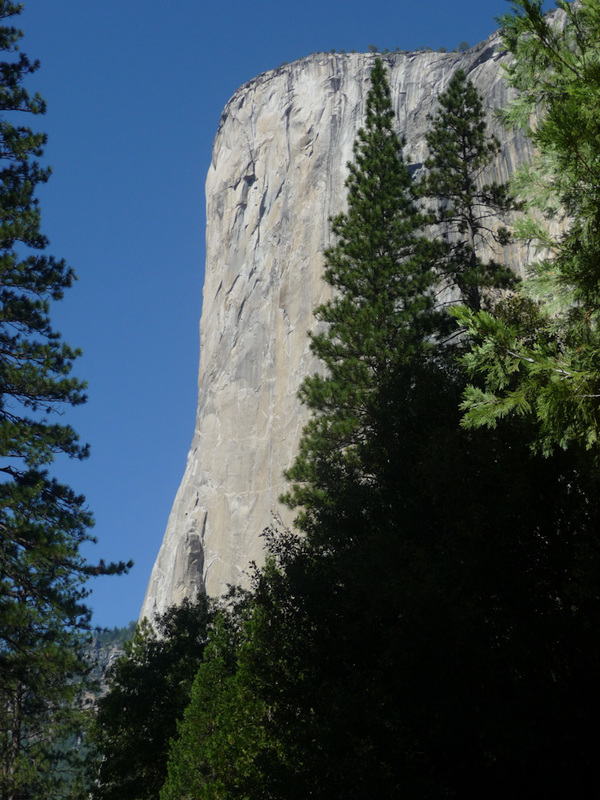 Then we approached El Capitan, and I photographed his magnificence from several angles, progressing from east to west. We had hoped to find another cache a bit of a ways down Route 41. It had been chosen as a favorite by many people. Unfortunately, it committed us not only to the distance out and back, but also to some distance further back into the valley along the one-way road before we could come to a turnaround. All told, it would probably add about 10 km (6 mi) of distance. It was already nearly noon, but it sounded like such a great cache, and we had planned on a lot of extra time, so we started to go for it. 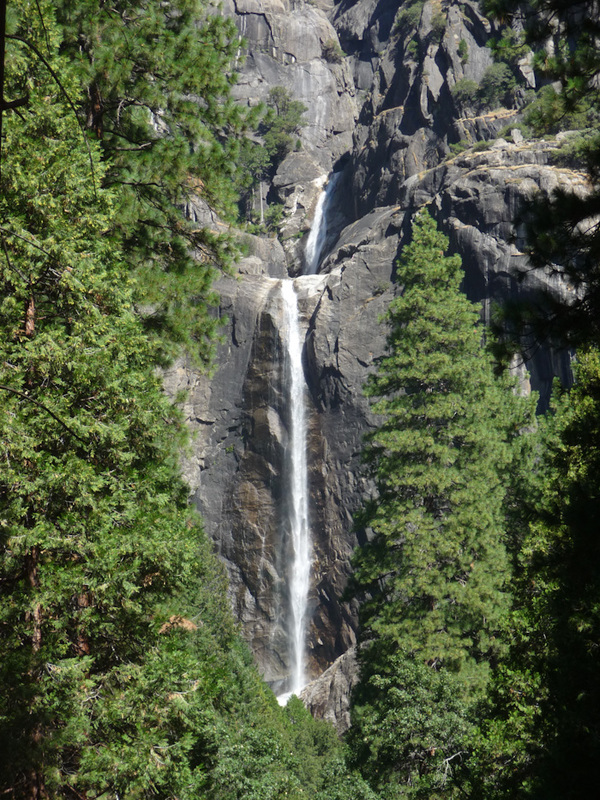 Soon, we came to Bridalveil Falls, and we couldn't pass up the opportunity to walk up the short trail to the base. There were far too many people for us to ride the bikes. 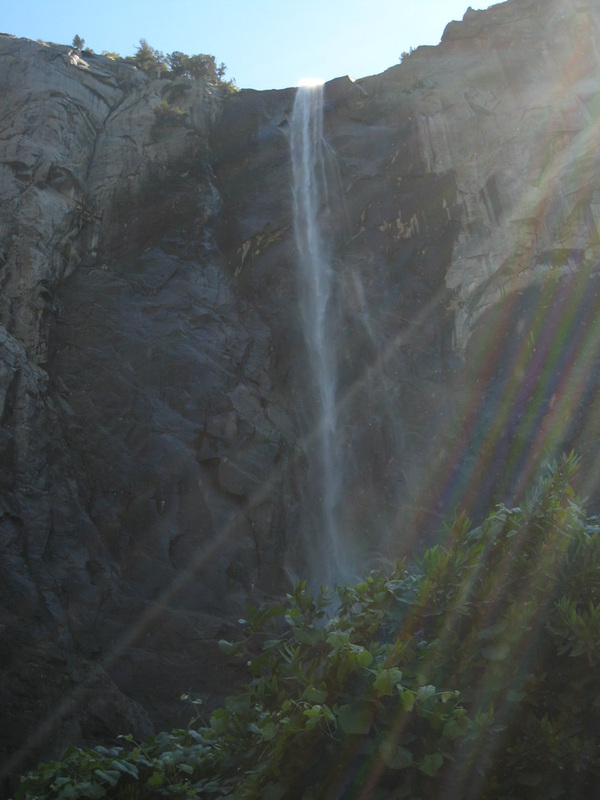 Eric took a picture of the falls in the sun. This all took so long, however, that we decided to come back for the cache at some future point with Sydney. We decided we would have a better time the whole rest of the day if we didn't spend it having to make up for lost time. For once, we decided, we would skip something in order to keep to a better schedule. This turned out to be a very wise decision. 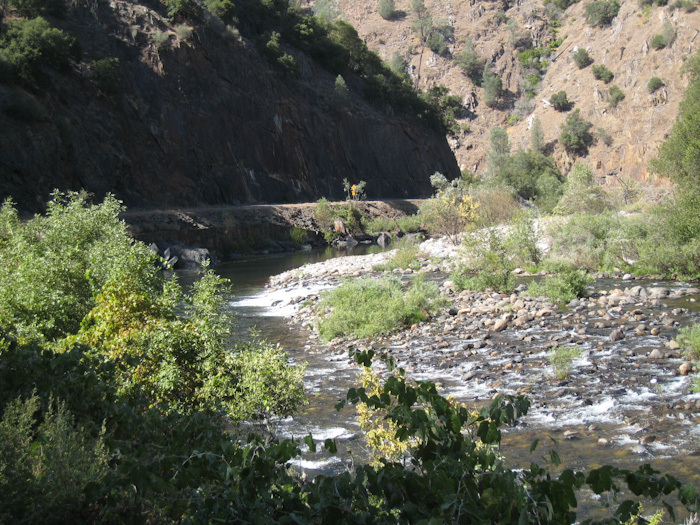 We were still committed to the one-way loop back through the western part of the valley. We realized that we had not had anyone take our picture together. 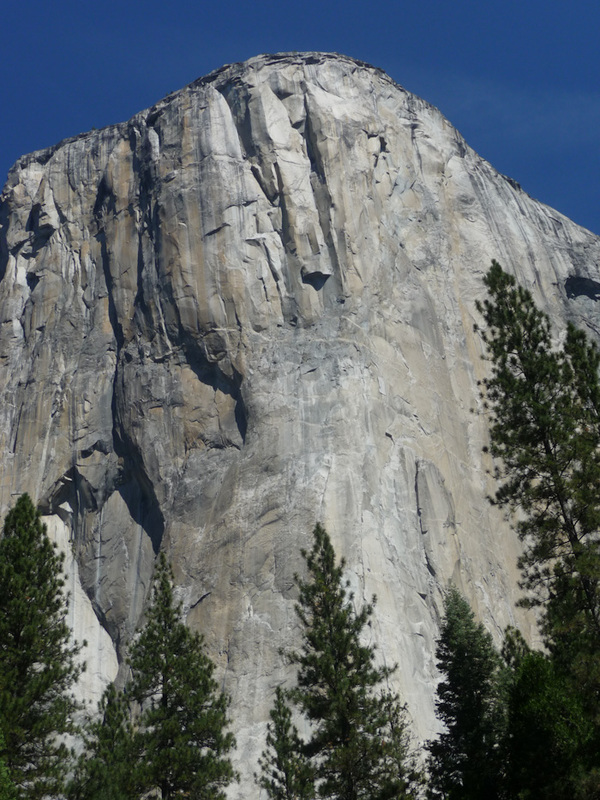 We found some photographers with very nice cameras and beautiful long lenses spotting climbers on the face of El Capitan, and asked one of them to take our picture. We thought he would have included El Capitan in the picture. At last, only about 45 minutes behind schedule, it was time to leave the valley and start the descent down to El Portal. I gave Eric a big hug and a kiss in case we didn't make it down. But as I said, I worried about all the wrong things. The descent was no problem. It was beautiful! It was fun! I enjoyed it! We were going fast enough that hardly any cars passed us at all. At one point, I reached 52.9 kph (almost 33 mph). That's not at all fast by the standards of most serious cyclists, but Eric was still very proud of me. We stopped for more peanut butter and jelly sandwiches at the picnic area near the ranger station where Eric had changed my tire the day before. 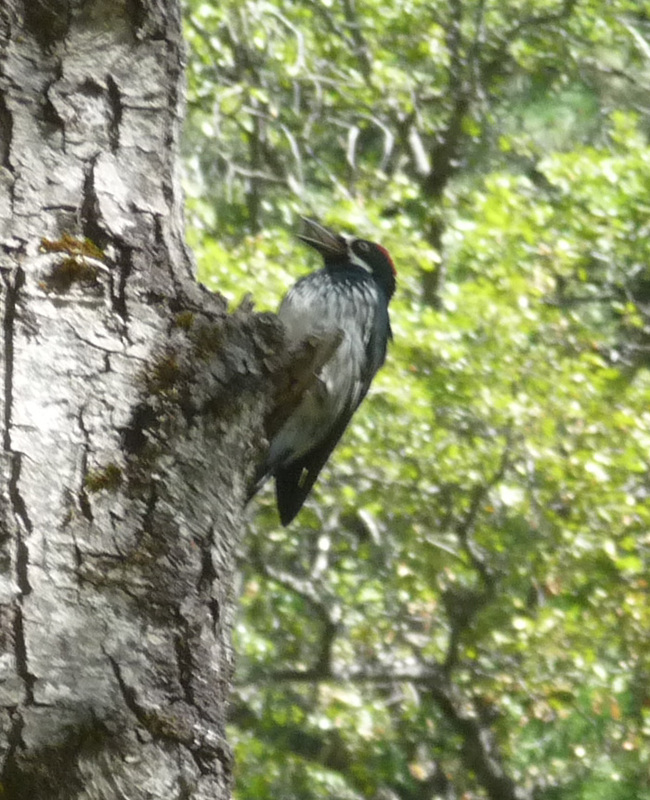 There was a child in a coonskin cap, and a woodpecker who posed for me. In re-reading the route description from the book, I noticed that we had not followed the route exactly. We were supposed to have left Route 140 for a short bit and taken Floresta Road into El Portal. We decided to do the short distance on the quieter, less traffic-ridden, road on the way back. I mentioned previously that Route 140 was originally built as a train route. 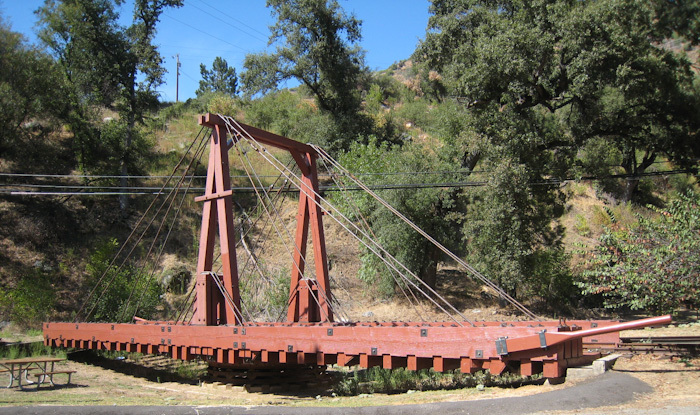 Floresta Road had a Park Service exhibit on the historic railroad. 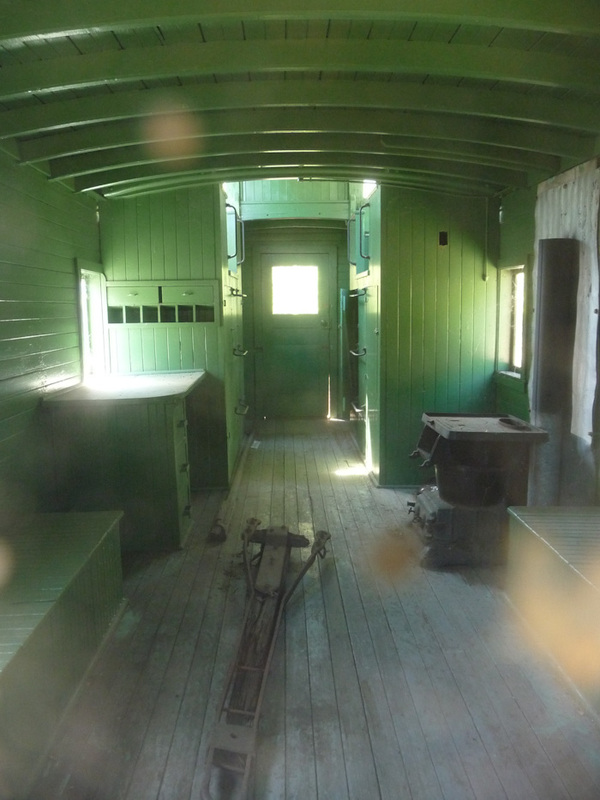 The inside of the caboose, which you unfortunately could not enter. You could, however, get into the engine! Photo obviously by Eric. 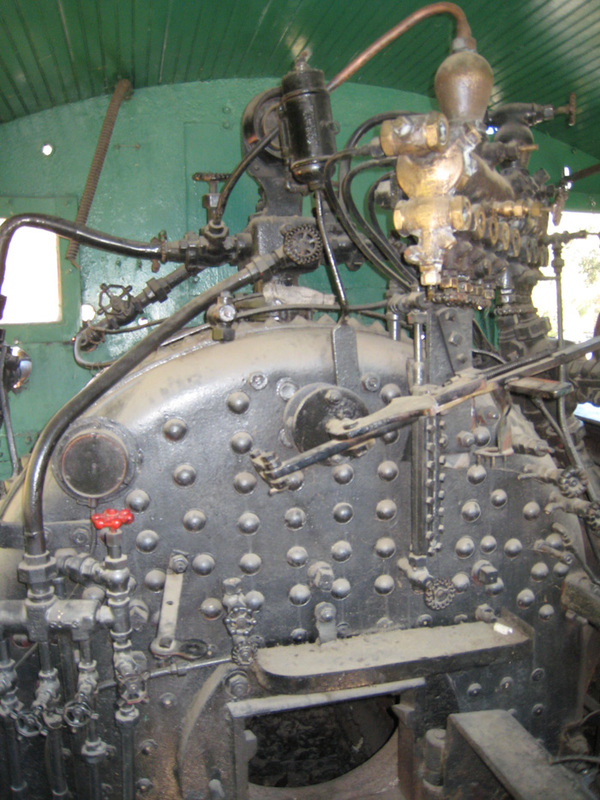 The inside of the engine. Photo by Eric. El Portal had been the point where they turned the trains around and sent them back to Merced. 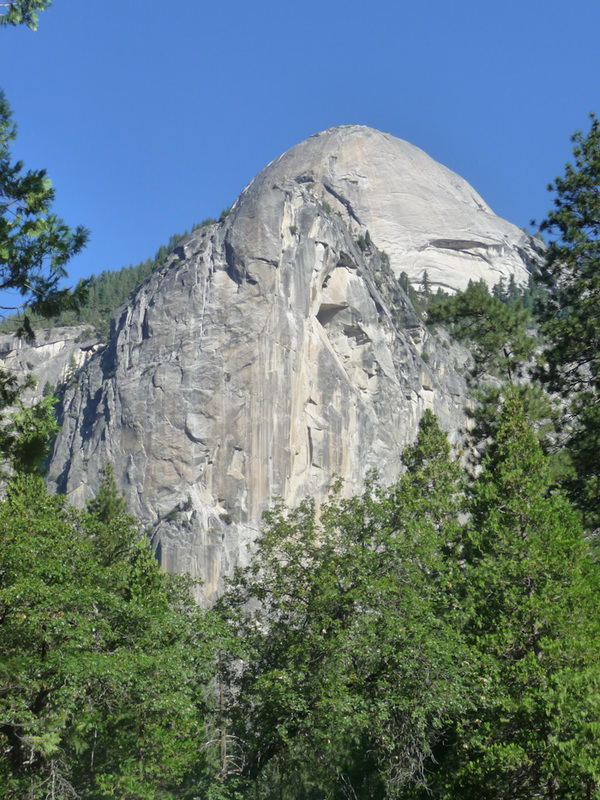 Yosemite visitors would continue up the steep hill in horse-drawn carriages. Eric took a picture of the turntable. 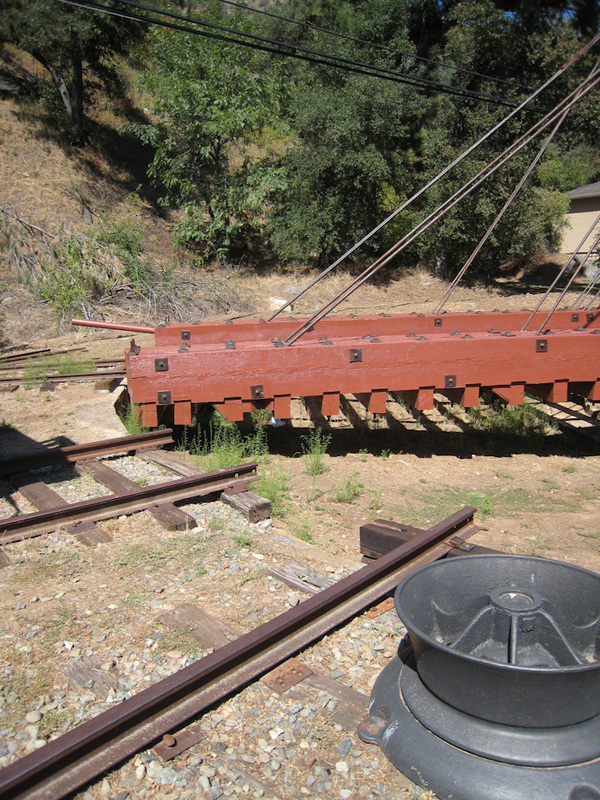 The trains were turned from one track to another by hand, using large levers. Photo by Eric. We spent some time enjoying the train exhibit, but we had come down the hill so well that we were still only the same 45 minutes behind schedule. We were within an acceptable tolerance, provided we did not have to wait a long time for the traffic light at the one-way section of the road, which was still some distance away. 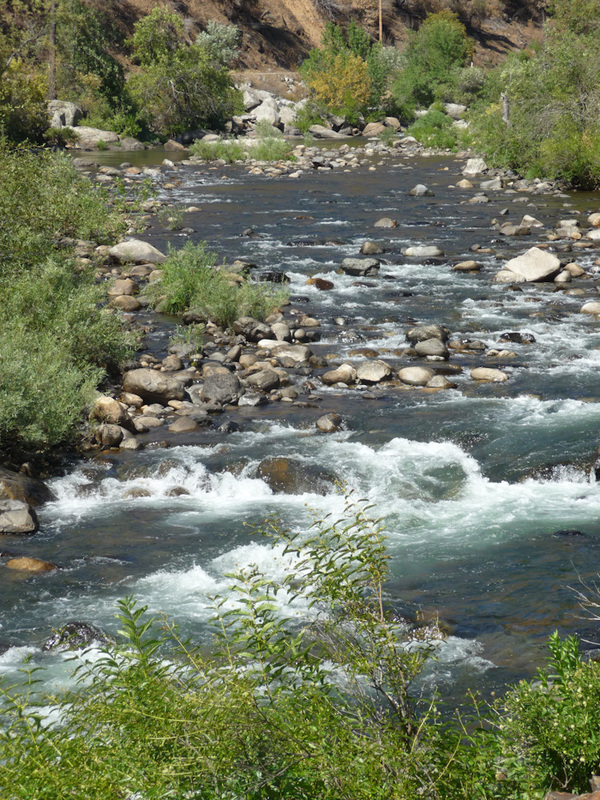 Eric took a picture of the river as we crossed back over it onto Route 140. I took a closer-in shot at the same spot. The day was a bit cooler than Saturday had been, and we enjoyed the lovely scenery. Eric took my picture in this beautiful place. 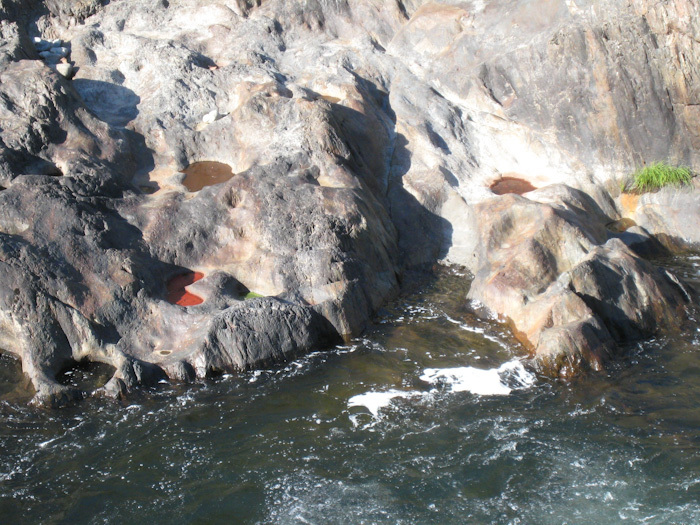 Eric took a picture of these fascinating pools. While we were still losing elevation, the terrain had flattened out quite a bit, and we were back to riding much slower than the surrounding traffic. Eric got behind me and began motioning to motorists to pass us with more room, also indicating to them when it was safe to pass. 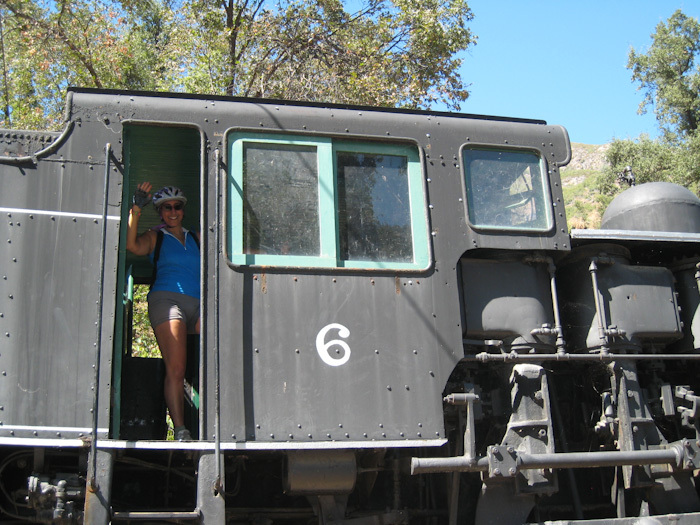 Most of them actually paid attention to his signals, and I felt much safer and more comfortable than I had on the way up. Recently, the State of California tried to pass a ridiculously sensible law that motorists must give cyclists one meter (three feet) of space when passing, or, if that were not possible, slow to within 25 kph (15 mph) of the cyclist's speed. That a no-brainer like this could fail even in California saddens me deeply. We've got a long way to go. 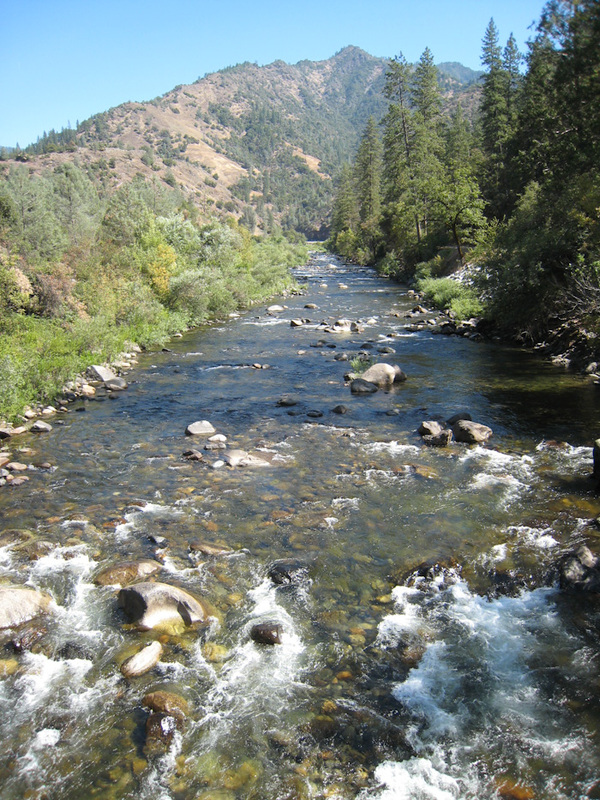 Eric photographed more scenery, the river with the winding road in the background. 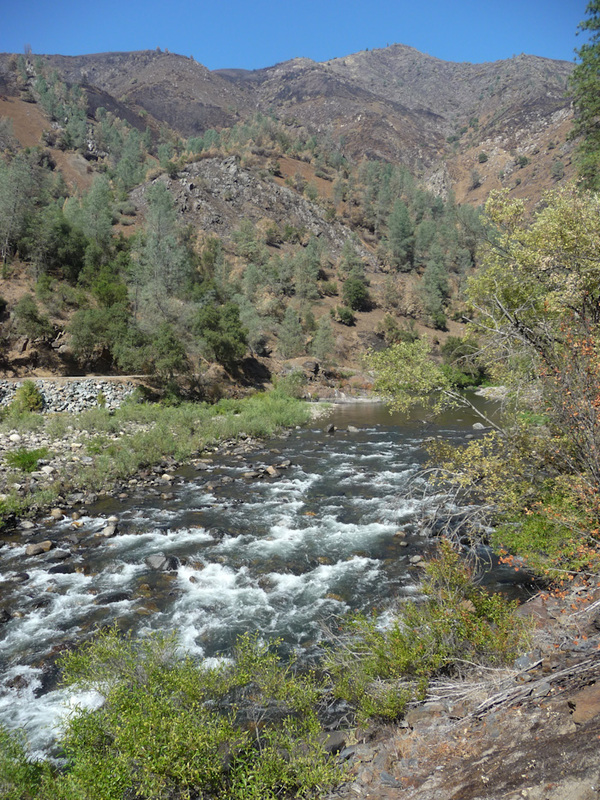 I loved the river and the canyon it had carved. 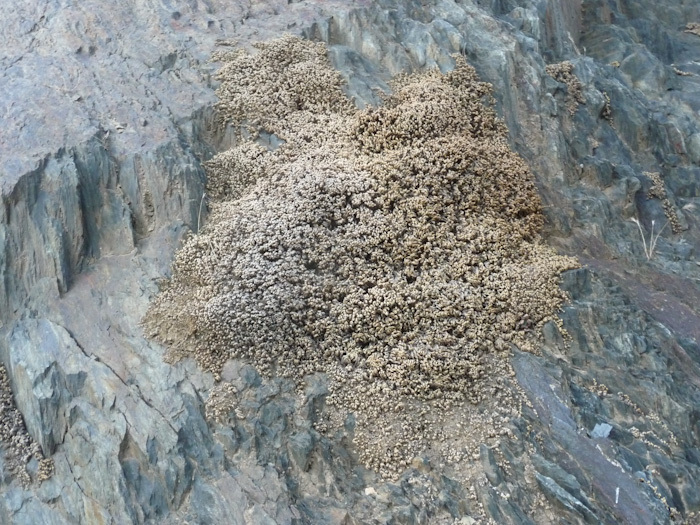 I noticed some strange stuff growing on a rock. 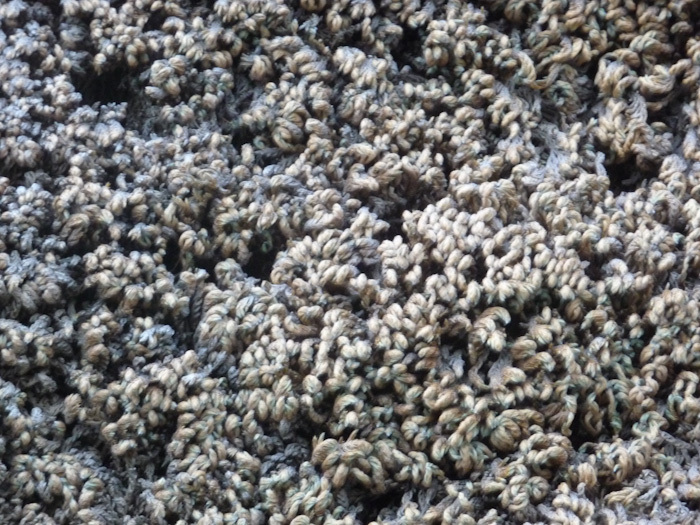 Is this lichen? Close-up, it was quite facinating. We were coming up on the one-way road section, fearing a 15-minute delay. Luckily, we only had to wait about four minutes for the light. Unluckily, however, just as I started through the light, I noticed that my front tire was, once again, flat. 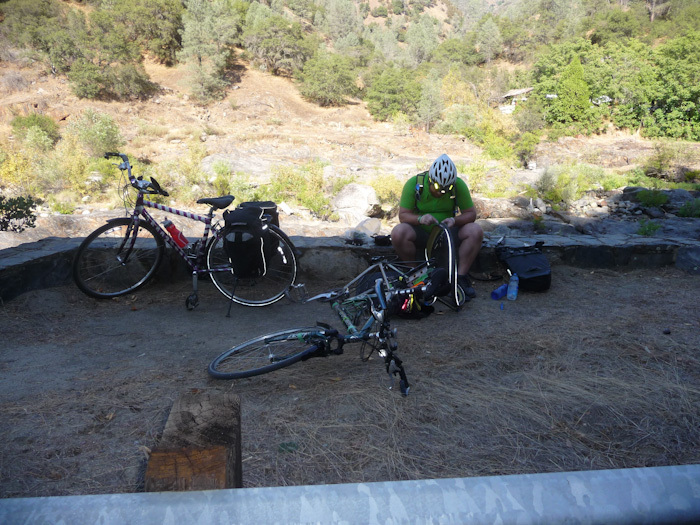 There is no good place for a flat tire, but this was the worst possible place on our route for one. I wanted to ride through the one-way section rather than risk waiting 15 minutes for the light again, but Eric insisted that I would ruin my rim. 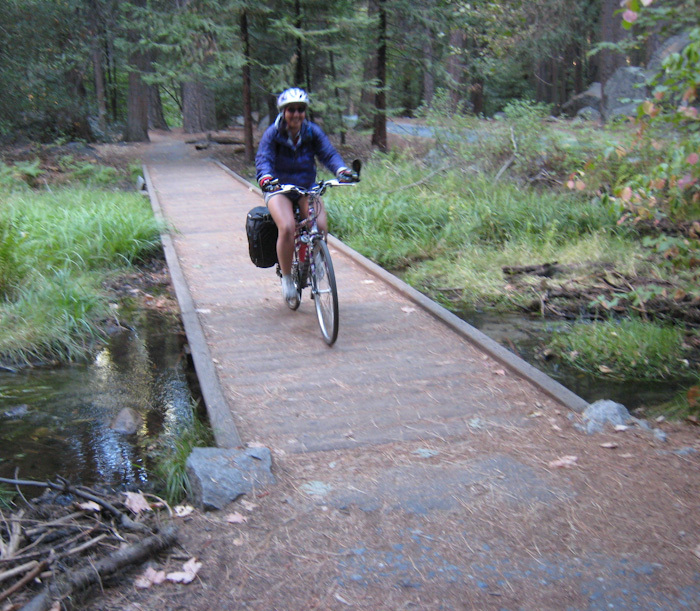 I settled for riding across the bridge over the river and stopping in a spacious spot. This time, I was less helpless and more proactive about helping to change the tire. I carefully inspected the tire for sharp objects. 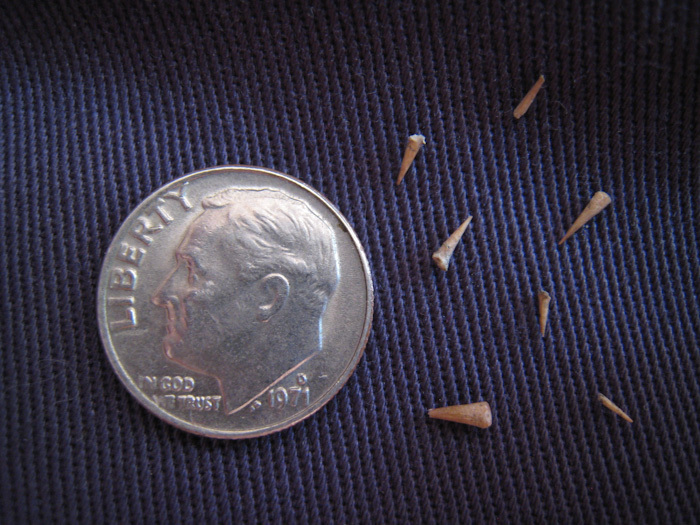 All I could find was a thistle thorn. Could this have caused the puncture? Since it went all the way through the tire, Eric believed so. He took out his spare innertube and put it into my tire and onto my wheel, with the tread facing in the correct direction this time. At least I would have the correct size tube now. He started pumping up the tire, but quickly became over-tired in the heat. I tried my hand at it, but found that I was fairly useless. I couldn't push the pump down to the bottom of the stroke, which is the part that actually pushes the air into the tube. Eric had to finish pumping the tire, resting periodically. We were now definitively behind schedule, and we still had to make sure that we started down the road through the rest of the one-way section while the light was green. I had been watching it carefully, and noticed that it actually changed approximately every seven minutes. Apparently, the people who put up the "15 minute wait" sign expected people to have to wait through two cycles of the light. All the same, when we saw cars coming through the light in the direction we were going, we grabbed our bikes and jumped on them before we were fully prepared, just to get through the one-way stretch without losing another seven minutes. I was becoming concerned about the time, and getting home soon enough to get up for work in the morning. I was just telling Eric that, even though we had found only 1.5 caches so far on the trip, we would need to skip some of the upcoming ones, when one of Boing's tires went flat. This image was rapidly becoming the overriding metaphor for the trip. It turned out to be another one of those evil Yellow Star Thistles. Not only are these awful plants extremely harmful to bicycle tires, they are an invasive species from Eurasia that crowds out and kills native plants and they are toxic to horses (according to the USDA National Agriculture Library). While the previous two flats had been punctures through Scheherazade's stock front tire, this time, the horrible thistles had managed to penetrate even a puncture-resistant tire. 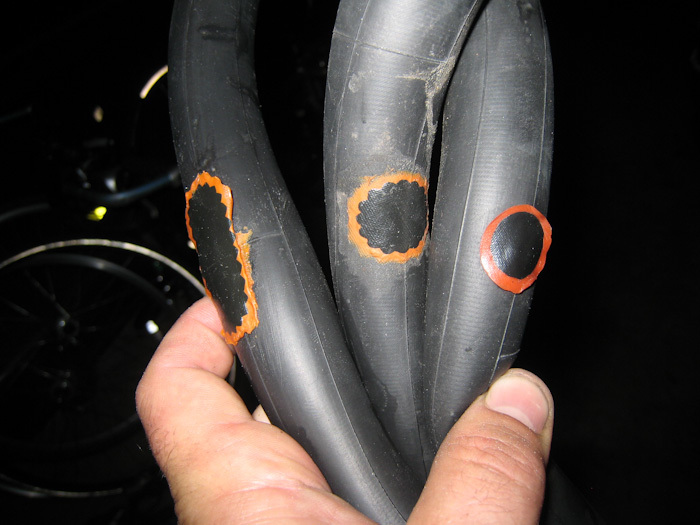 Even though we had brought what we thought was an abundance of spare tubes with us (two), at this point, we were out of fresh ones and had to resort to patching the tube Eric had taken out of Scheherazade's tire on Saturday. Good thing he had told me to save it! Eric removed a previously-used patch kit from his bag, only to find that the vulcanizing fluid (the stuff that sticks the patch to the tube) was completely dried up. Fortunately, he found another patch kit in his bag, a free one he had gotten from Bike to Work Day. He applied the vulcanizing fluid, and then we had to wait a bit for the patch to set. Time was just slipping by. At least, as Eric pointed out, we had a pretty place for flat-fixing. All of the tire pumping in the heat was tiring Eric, so I offered to pump in the first 2,400 mb (35 psi) or so, which is the easier part of pumping up a tire. I was able to pump for what I felt was an impressive amount of time for a middle-aged woman, although I forgot to pay attention to which direction I was facing until some unkind people hollered something out of a car window. Note to all similarly unkind people: Virtually anything you shout out of a moving car will be entirely unintelligible. Note to the rest of you: Being able to bend over, even in an emergency situation, without paying attention to which way you're facing, is a male privilege. It only underscored the difference between the place where we were and the places we usually cycle: we saw no other bicyclists at all on Route 140. If we spent this much time changing tires anywhere in the Bay Area, surely another cyclist would have stopped to help us. It's a tribal thing. But other than each other, we were in the presence of motorists only, and there was no one to rely on besides each other. Eventually, I reached the maximum pressure that I could put into the tire and had to turn the Master Blaster over to Eric. The evil Yellow Star Thistle thorns. Photo by Eric. Although we certainly could not have anticipated not one but two flat tires in a day, we were surely thankful that we did not take the extra time to try to find the Route 41 cache. 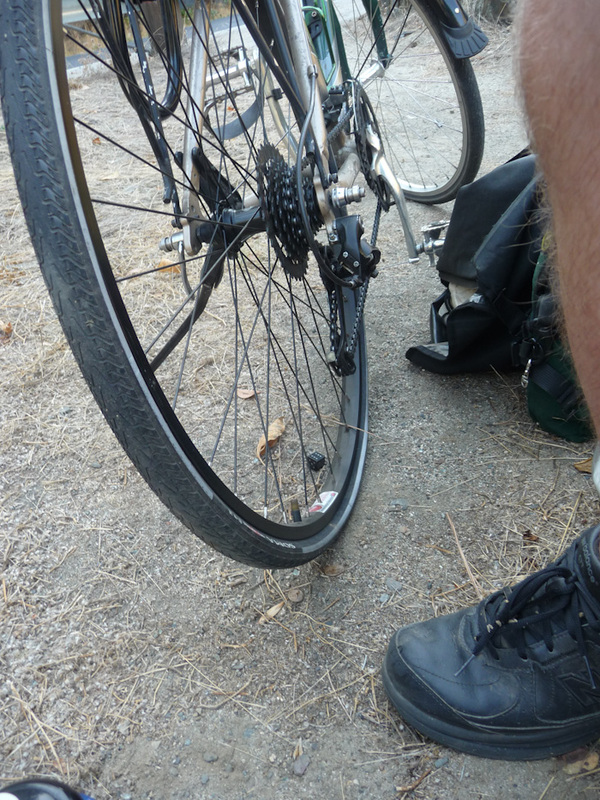 We were only able to go about 100 m or so (~100 yd) before Eric's tire was flat again. Apparently, the evil star thistles had punctured it in more than one place. We pulled off the road again and sat, trying to avoid the evil star thistles surrounding us. It was getting so late at this point that we considered whether I should go on alone back to Sydney on my own and come back with her to pick up Eric. We still had another 14 km (about 8.5 mi) to go, including the 5-km (3-mi) steep climb at the end. "What if I get another flat tire?" I worried. "I'll be walking Scheherazade up that stupid hill in the dark." Eric hoped that at that point, I could get a ride with a trustworthy-looking woman, but ultimately we rejected the idea of splitting up, at least at that point. It wouldn't be a successful bike trip if only one of us was able to ride the entire distance. We agreed that, rather than continuing to listen to the audio version of Harry Potter and the Goblet of Fire on the way home, I would try to sleep while Eric drove, so that I could make it to work the next day. We had to go through the whole procedure again, removing the tire from the bike, inspecting the tube, and patching yet another hole. Fortunately, I had brought along a patch kit as well. At least we were well-prepared. "I'm happy to be out flat-fixing with you, honey," Eric declared. At last, as darkness was beginning to descend, we set out again, with the hill still ahead of us. At this point, I wasn't even enjoying the scenery very much, I was just counting down the distance left to go. Every bit we covered was one less bit one of us would have to ride alone if yet another flat occurred. Auto traffic coming from behind us had been bunched up in groups by the traffic light at the one-way section. We would ride for a while with no cars at all, and then ten or so already-frustrated drivers would suddenly pass us. It became worthwhile just to find an opportune place to pull of the road and let them go by, but often these places were full of thistles. I tried to ride carefully between the thistles, fearing yet another flat with every crank of the pedals. 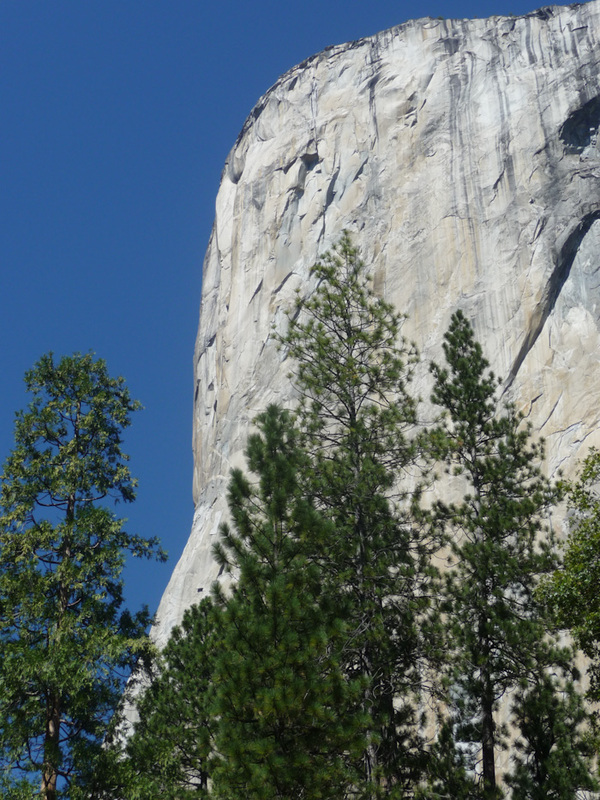 About three-quarters of the way up, I stopped in a pullout because I felt a sudden wobbling, a dread feeling to which I was becoming overly accustomed. Sure enough, Scheherazade's rear (puncture-resistant!) tire was now soft. For crying out loud! In the low light, Eric inspected the tire, and decided that, for the remaining distance we had to go (about 1.5 km, or 1 mi), he could just pump it up again. While he was at it, he re-pumped Boing's tire up as well. While resting from all of this extra activity, he realized that there was a geocache in the pullout with us, and that we could nearly double our number of finds for the trip by finding it. It turned out to be trivial to find, and it gave us a slight measure of satisfaction in the midst of all of our adversity. By the time the lighted sign of the Bug Hostel came into view, it was fully dark. I can't tell you when was the last time I was so happy to see a place. Upon reaching the entrance, we still had a very steep climb up to Sydney's parking spot. This would have been even longer and steeper had I not moved her down to the lower parking lot, which was lower but still by no means low. There was a geocache in the bus stop at the entrance, so we once again significantly increased our number of finds for the trip in just a couple of minutes. The road up to the parking lot was very, very steep, and we were very, very tired. At one point, a speed bump forced us to stop and restart. After about ten minutes of misery, at last I saw the parking lot ahead of us. We were enormously relieved to have reached the comfort and safety of Sydney. While we might still suffer an automotive flat (fortunately, we didn't), at least there would be no more bicycle flats on the trip. 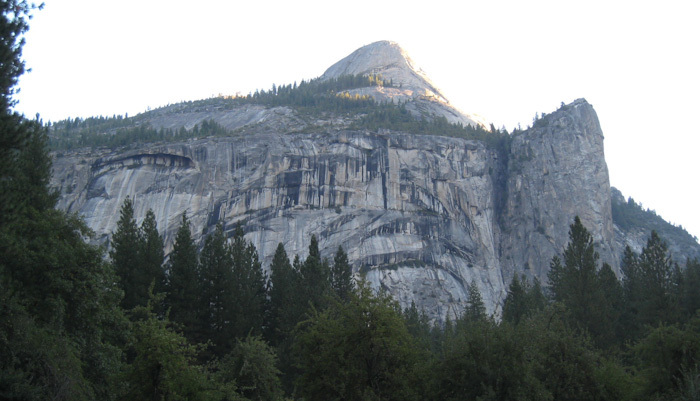 The entire trip from Yosemite Valley had taken a whopping eleven hours. Later, Eric took a picture of the three patches he had to put in one tube (the last one back at home). The top item on our agenda at this point was a shower. We removed the items we would need for the rest of the trip from Sydney's trunk, replaced them with all the bike stuff, and locked the bikes up on the rack. We then trudged up the steep hill (which was much easier on foot!) to the showers. We removed all of our excessive sweat, and put on fresh clothes. We felt considerably better, and were noticing our hunger. "What time is it?" Eric suddenly asked, as we headed down toward the dining area. "Uh-oh," Eric said. "I hope they don't stop serving at 21:00." Apparently, we should have prioritized dinner over a shower. While the sign above our heads said that dinner was served until 21:30, the man at the counter said that those were the Saturday hours and that they had forgotten to change the sign. He offered us some pastries that were left over from breakfast. Eric turned away in frustration. I had been balking at the prices on the menu, which seemed high for a hostel. Although we still had more than three hours' drive home, after all of our troubles, we felt that we deserved a sit-down dinner. We stopped in at the "front desk" (in a trailer) to ask where we could get a hot meal. They recommended the Miners Inn in Mariposa, about 16 km (10 mi) down the road towards home, which they hoped would still be open. 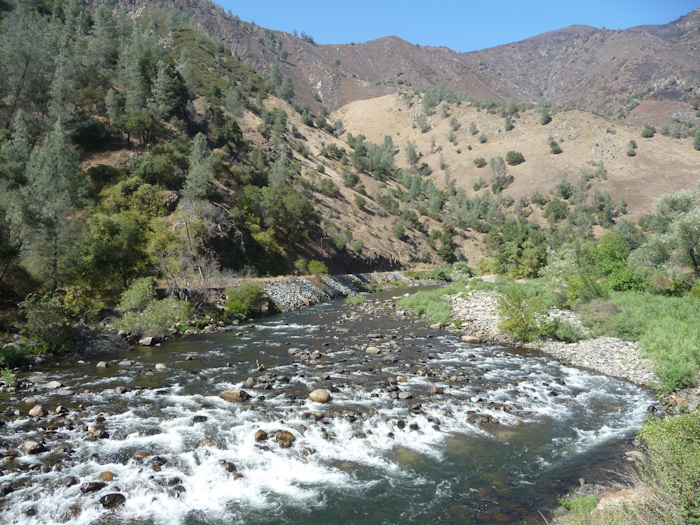 Otherwise, we would have to go all the way to Merced (at least an hour away). The Miners Inn was open until 22:00, and it turned out to be a fantastic recommendation. We loved the place. I've mentioned that 140 was an old train route, and the Miners Inn had a scale model of the old railroad all around the dining area near the ceiling. The host pointed it out to us, but apologized that the train was not currently running. Apparently, it had derailed a couple of days before, crashing down onto someone's table! How sad! Part of the miniature railroad. 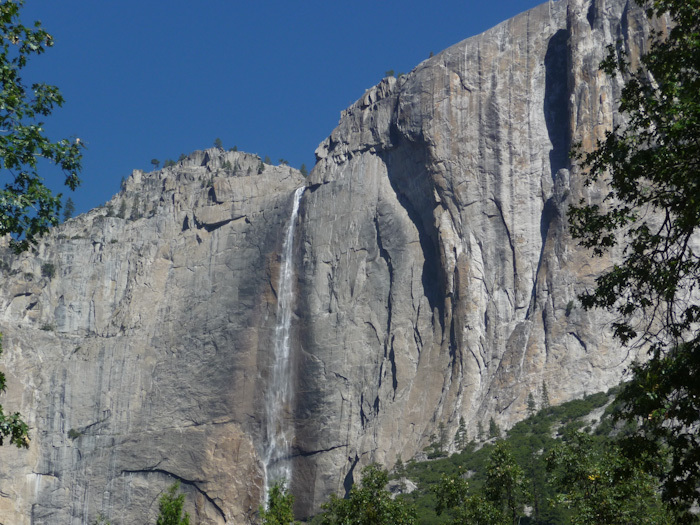 One wall had a miniature Yosemite Valley. The service was good and very friendly, the menu choices vast, and the food tasty. I almost want to go all the way out of the way to Mariposa again just to eat there with the train running. Finally, at 22:30, we got back into Sydney and headed back down the hill to the Bay. Traffic was light at that late hour, so we got home a little bit after 1:00. Eric had some caffeine and drove while I dozed in the back seat. I was able to make it to work the next day, but I suffered from massive headache pain. In the end, I don't know how to feel about this latest bike trip. Certainly, the scenery was spectacular. And the trip was ultimately successful, in that both of us were able to ride the entire planned distance. No injuries were reported, other than mild dehydration and sore muscles. But while we've been slightly delayed by mishaps on trips before, we have never had this number of mishaps and problems and been delayed by so many hours. I suppose I should feel good that, while no cyclist (especially no cyclist with puncture-resistant tires) would possibly expect five tire punctures in two days without riding through a field of broken glass, we were actually sufficiently equipped to make that many innertube repairs. Between us, we had two spare innertubes, three patch kits, a set of man muscles, and, importantly, the Master Blaster pump. While Route 140 is indeed amazingly pretty, I can't say I would recommend this ride for any cyclist who does not have nerves of steel when it comes to traffic. I have no problems riding down Market Street or San Pablo Avenue, and even I found my nerves pretty rattled on 140. 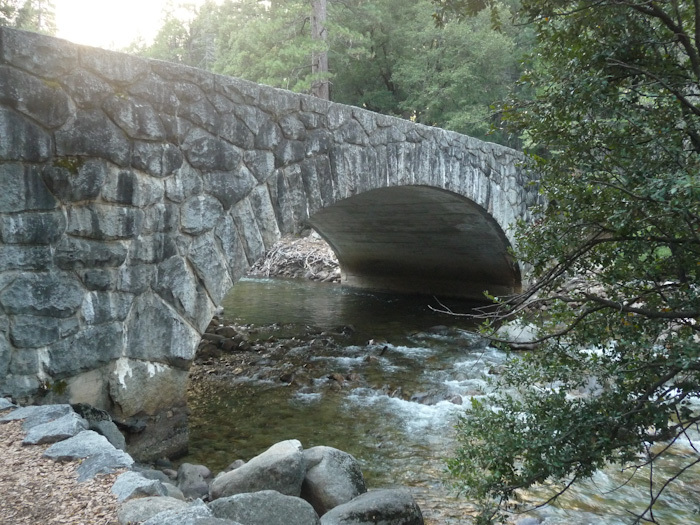 While I would happily repeat the trips we have taken to the Mendocino wine country and to Big Basin and Santa Cruz, I am not sure I would do this one again. But maybe some of the reason why I felt so bad at the end of the trip had to do with the dehydration. Now that I have had a few days for my system to recover, I am feeling somewhat more triumphant about having overcome the adversity. I have one major takeaway as a piece of advice for other touring cyclists: Carry the Master Blaster. You won't regret it.